Bones season 8 will not go down in the history of the series as one of my personal favorites. It's been all over the place in terms of plot, development and public service announcements. Tonight's episode had some of the hallmarks of seasons past but ultimately fell a little short of the mark. As a finale, "The Secret in the Siege" brought closure to just about nothing. There was so much to love and hate that it's really hard for me to get a read on exactly what I'm thinking about the concluding hour. Pelant's much-promoted return felt a bit anti-climactic, probably because it was no surprise that he'd be back. 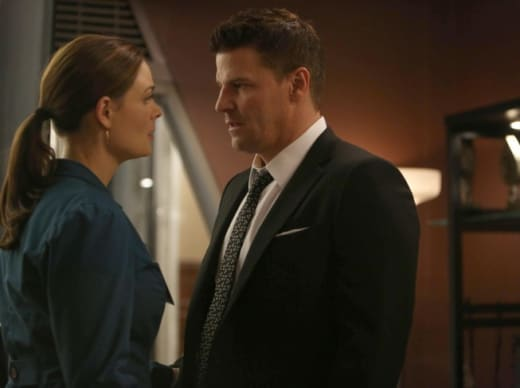 Bones proposing to Booth was also anti-climactic because we pretty much saw it in the previews. There were twists to both aspects of the episode, yes, but were they twisty enough? That's the question I'm not sure I can answer. I've been a fan of Pelant since he first appeared last year. He had the makings of an terrific villain. He was smart, cocky and always two steps ahead. But he wasn't entirely untouchable. Now that he's isolated himself inside his creepy TV room and never has to get his own hands dirty, he's become silly. I waved my hand and poo-pooed when he hacked a drone and pointed it at a school. Meh. Surely there are some who can do that and he had all that clearance when he worked at the private military firm. His antics tonight, however, just put him straight into the realm of completely unbelievable. He hacks a traffic light, okay. Sure, maybe. But hacking all of the traffic lights, shutting down entire cellular networks, creating weird videos of a dead man to send the dead man's daughter on a murder spree, being able to tap into any and every security camera anywhere, and having that ultra-fancy lip reading software? Nope. Instead of being a villain I love to hate, he just became a villain I hate. Part of my hate definitely stems from the fact that he ruined Booth's life by making him tell Brennan they can't get married. And what shocks me about that is that I haven't been in favor of her proposing at any point. I do hate to say I told you so, but well, I'm going to. Booth's mother's return only served the purpose of softening Brennan to the idea of getting married. Their back and forth about her catching the bouquet and how she's a terrible catch and it was her subconscious desire to get married was just so "I told you so." That was the entire reason for that episode. Yes, being afraid to lose Booth and Pelant's return was another factor in Brennan's proposal. That and that alone would have been enough for her to have believably changed her mind regarding marriage. And the ending of the episode, with Booth essentially breaking her heart, still could have happened and still would have worked. She opened her heart to the idea of marriage after having been against the institution. She was excited and started to dream and plan. Booth crushing those dreams because Pelant said to makes me really hate Pelant. Really. Ugh. Moving on so I don't just Pelant-bash all night. In things that made me happy, I was glad that Sweets wasn't shot. I don't hate him the way some do, but beyond that, I don't like seeing our principal cast die. Vincent Nigel-Murray was only a squint and watching him die was enough. Yes, Bones is a drama, but it doesn't feel like that kind of drama where character exits are by death. Maybe that's just me though. I'm okay with that. I loved Angela and Hodgins interacting tonight, too. They're so good together. He feels terrible for letting Pelant get away and she knows that he's not the guy who kills people. Pelant has taken a lot away from them, but she knows that Hodgins killing him would've been worse for Hodgins than losing his money has been. I hope the next season, if there is a next season, picks up right where this one leaves off and Pelant is gone in the first episode. His story feels tired. It's run its course. Let's move on to another super villain and return this show to its early glory. What did you think of "The Secret in the Siege?" Are you tired of Pelant and irritated that he wasn't caught in the finale?